NATO jets continue to hit targets in a number of strongholds of fugitive Libyan dictator Moammar Gadhafi, while the offensive by revolutionary forces on a key loyalist town has stalled. NATO warplanes pounded targets in a number of strongholds of support for fugitive dictator Moammar Gadhafi, the alliance said Tuesday, as an offensive by revolutionary forces on a key loyalist town stalled. The alliance said Tuesday that airstrikes struck one radar system, eight surface-to-air missile systems, five surface-to-air missile trailers, one armed vehicle and two command vehicles a day earlier near Gadhafi's hometown of Sirte on the Mediterranean coast. NATO, which has played a crucial role in crippling Gadhafi's military capabilities over the seven-month Libyan civil war, also said it struck six tanks and two armoured fighting vehicles in Sabha in the southern desert. Those two cities, along with Bani Walid, southeast of the capital, are the primary bastions of Gadhafi loyalists remaining in the country more than three weeks after revolutionary forces captured Tripoli Aug. 21, effectively bringing an end to Gadhafi's nearly 42-year rule. The ousted former dictator, whose whereabouts are unknown, urged his followers Monday in a brief message read on Syria's Al-Rai TV to keep fighting. Despite the call to arms, Canadian diplomats are back in Tripoli, seven months after evacuating the North African country, and are preparing to reopen the Canadian Embassy. The small contingent, led by Canada's ambassador to Libya, Sandra McCardell, arrived in the Libyan capital on the weekend to conduct a security assessment. On Tuesday, Foreign Affairs Minister John Baird said the permanent embassy building needs refurbishing following the fighting, so a temporary location will be established in Tripoli. 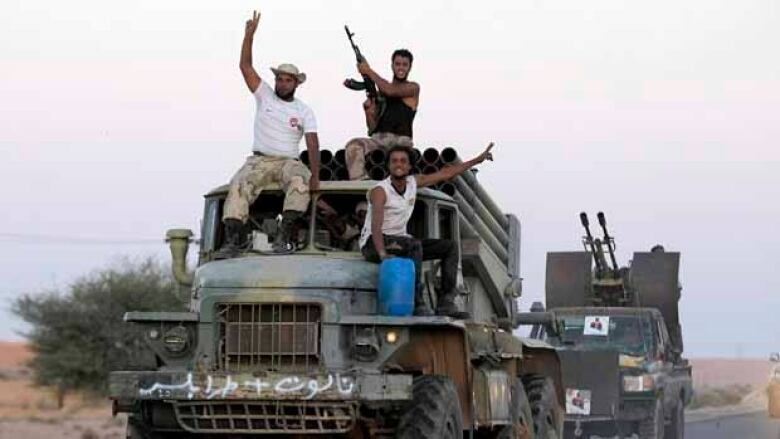 Gadhafi's supporters, who claim he is still in Libya, have put up fierce resistance in Bani Walid, some 140 kilometres southeast of Tripoli, beating back repeated attempts by revolutionary forces to take the town since launching a two-pronged assault Friday. The former rebels say they have captured the northern half of Bani Walid, but they have struggled to push farther into the city for several days. Families continued to stream out of Bani Walid on Tuesday to escape the heavy fighting and deteriorating living conditions. Fleeing residents say there is no electricity or running water in the town, and shops are running out of food. 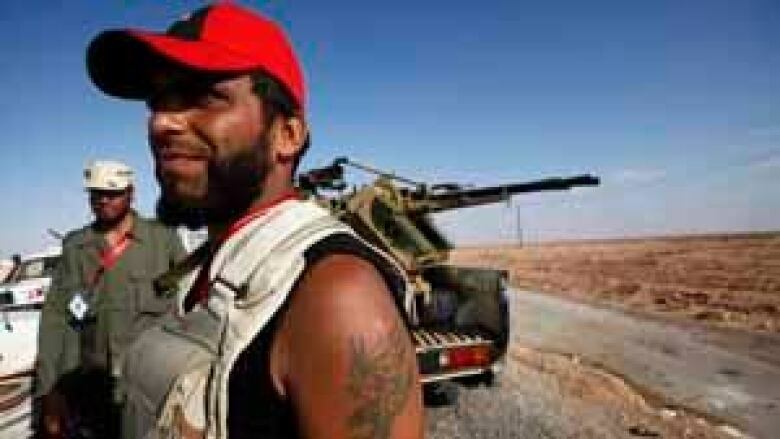 Saad Mohammed, a Libyan fighter preparing for the day at the town's northern gate, said snipers were taking up positions in the minaret of a mosque in the town centre, as well as a former Gadhafi villa built on the top of an ancient fort. "We're giving a chance for the families to leave the city to escape the mortar rounds and rocketing from the Gadhafi loyalists," he said.